We left the gite on the second Thursday of our holiday and started to head back towards the ferry at Calais. 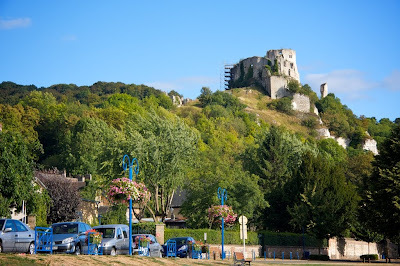 Our first stop was the little town of Les Andelys , south of Rouen, which was situated on a large bend of the river Seine. 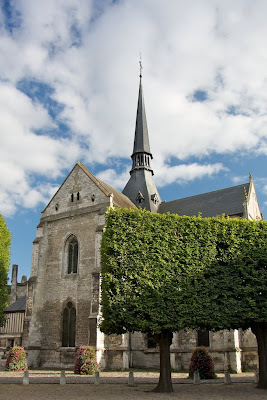 We chose this town because it was a good way towards out last stop at Arras and there was a small cheap hotel there. 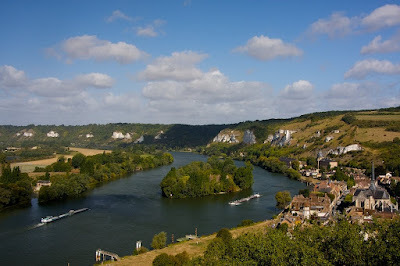 The bend in the Seine has dug into a plateau on the outside edge, exposing some white limestone cliffs along the bank. 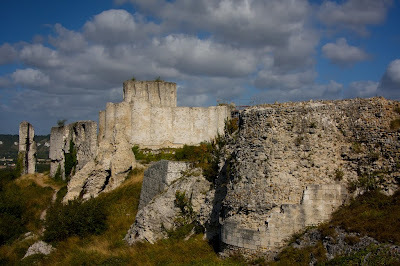 In the top of the cliffs is a ruined castle which was used by the English to prevent supply ships going up the Seine from the coast to Paris. 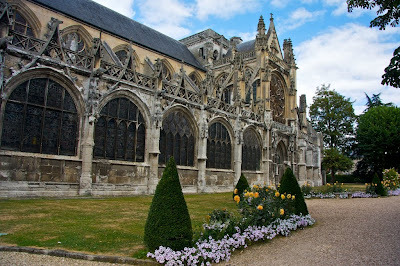 We've been to Rouen many times on our trips into France but have never stopped anywhere in this area before. Les Andelys itself is a bit back from the Seine up a narrow river valley and is quite small and fairly ordinary. The exception was this lovely church which, like many small towns in France, is far bigger and grander than you'd expect. 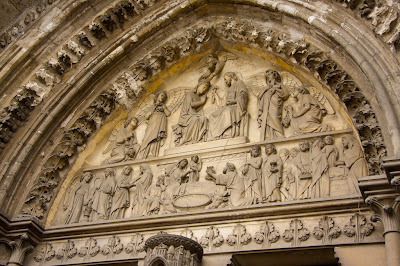 Above the main entrance is a beautiful relief carving depicting scenes from the bible. 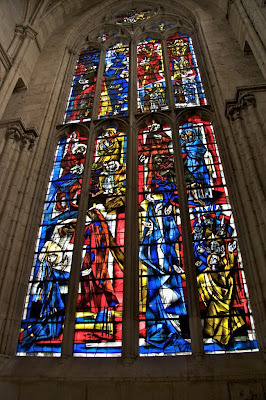 Inside there was quite a mixture of stain glass windows including this bright, modern looking one. The old town area is called Petite Andelys and is the part which is actually on the banks of the Seine. Here there is another, much smaller church than in the main town. This is also the more touristy area with lots of nice restaurants and old timber framed buildings. There is a path along the riverside which goes past an array of very different houses including this lovely big house with its balconies and shuttered windows. Some of the houses are much smaller and quaint. Further along the riverside is a big old building with a domed roof which we think was some kind of refuge but seems to now be a part of the new hospital. The following morning we made out way up to the car park above the castle. It seemed very strange that the castle wasn't on the highest point, but I guess then it would have been too far from the river. It struck me that it would have been too easy to have attacked the castle from this higher point on the plateau. 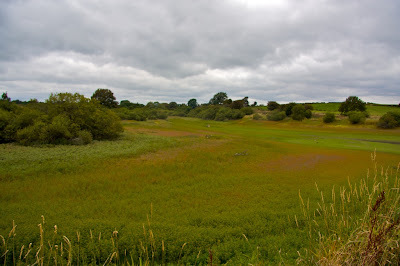 However as you get closer you see that there is a very deep, steep sided ditch just behind the trees in the foreground. I guess that it would still be quite easy to throw things over the wall from the high point with some kind of catapult. 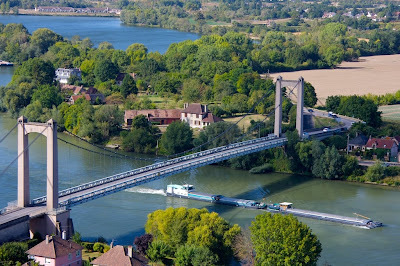 From the castle grounds there are great views of the river, the suspension bridge and the big barges going up and down. In the background of this photo looking South is a big lake next to the river and if you look on a map of the area there are quite a few of these lakes nearby. I'm not sure whether they are natural or man-made or what they are used for if anything. Looking North up the river you can see the big arc of white cliffs where the river goes around the massive bend. Apparently there was a smaller fort on the island and stakes set into the river bed to create a barrier. To the right of the river is the old town with the little church, further back is the domed roof of the refuge and the new hospital in the trees beyond. The riverside path goes way down the river to the next town. 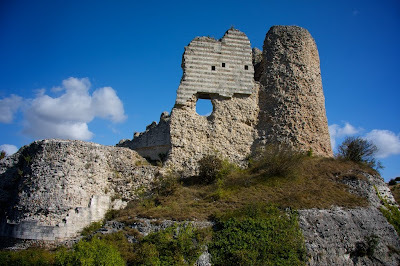 The castle itself is in pretty poor condition with the exception of the main keep in the centre. This is the only part that you have to pay to enter and it's not that exciting once your inside. To be honest they've tried quite hard to make it interesting and all the information boards are in English as well as French so that is quite good. 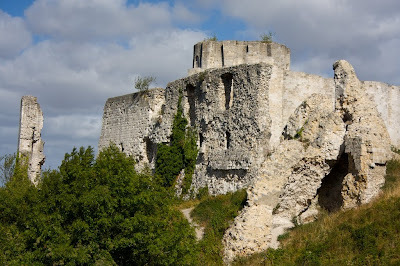 The main story about this castle is how the French managed to take it back from the English by sneaking in through a low window into the keep. Those sneaky, sneaky Frenchies. There are patches on the castle where the original finish has survived or been replaced during the renovations. In foreground of this photo you can see where one of the towers has fallen against part of the wall. This was caused by attackers digging into the soft lime below the foundations and then lighting fires which then made the tunnels collapse and the walls tumble. After the visit to the castle it's on to Arras. Next time. 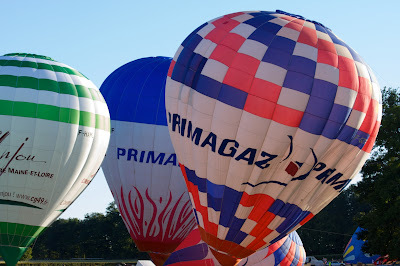 On the Monday after the balloon race and evening extravaganza at Brissac we had a thunderstorm in the morning. We had planned to go to the zoo on Tuesday and we were worried that the heatwave was over but on Monday afternoon it was as sunny and warm as before. So on Tuesday morning it was a bit overcast but we decided to go to the zoo anyway and hoped it would warm up as the day went on. The last time we came to the gite two years ago it had rained almost non-stop so we never got to the zoo then. On the way to the zoo we went on part of the ring road around Doue which was a piece of fast duel carriageway. On the fence, right next to the road, we spotted an enormous hunting bird just sat there watching the traffic. The road was quiet so I slowed down as we went past it. I'm guessing it was a buzzard, but the size of it, I wouldn't have been surprised if it wasn't an eagle. I very nearly stopped to take a photo but I wasn't sure how the French police would take me stopping on what was effectively a motorway. When we arrived at the zoo it was a little cool, very overcast and there was a sprinkling of rain on the breeze. We still tried to find a tree to park the car beneath because we thought it might be hot by the time we came out, and we were correct. The zoo is fairly unique as it is on the site of an old troglodyte village and an abandoned quarry. So in addition to the animals there are quite a lot of exhibits about the troglodyte way of life and also about the quarrying industry. A lot of the animal enclosures utilised the old troglodyte cave dwellings where the animals could shelter from the rain or sun. In the quarry part of the zoo there were two massive areas which had nets over the top where the birds were allowed to fly freely and also the larger animals had big areas to roam. It's not one of the biggest zoos that I have visited but the few animals have large enclosures and all seem very well looked after. Unfortunately I didn't make any notes about the birds and animals that we saw so no guarantees of any accuracy. 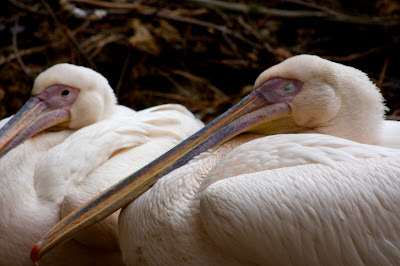 I think this first photo are a couple of pelicans. There were quite a few of them huddled together, I guess it might still have been a bit cool for them. 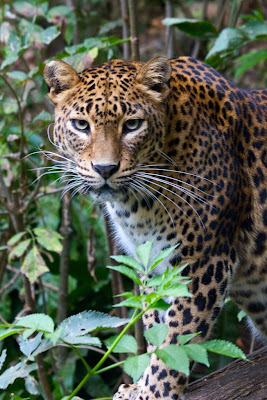 This leopard was walking along an old log and I felt it was eying me up as a potential for its next meal. Fortunately there was a layer of thick glass in front of it so it couldn't get to me. I got up very close to the glass to cut out any reflections of the people looking into the cage. There was a whole host of flamingos in this pool in one of the quarry areas but I like this image where I caught a couple on the edge of the group. Within the area where the flamingos were there was a load of different ducks. 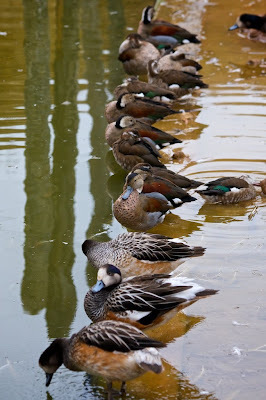 Here there was a bit of a step in the water where all the ducks had lined up. 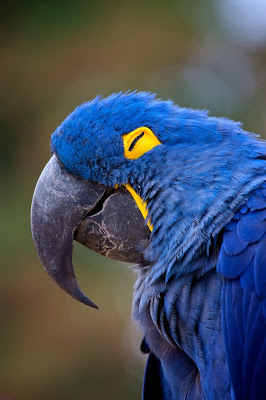 There was a couple of these bright blue parrots sat on top of poles where you get could get up very close. Unfortunately I didn't get a decent shot where it had its eye open. I had taken some good photos of this parrot when we first reached this first bird area (I think it was mainly South American birds). 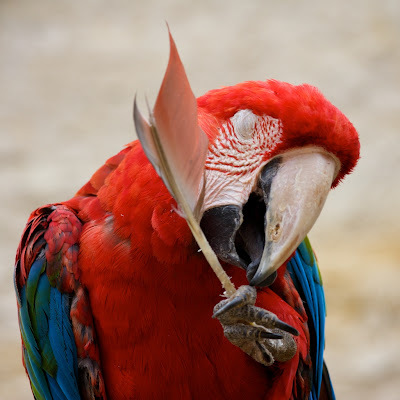 As we went back towards the exit I noticed that the parrot had got a feather from somewhere and was intent on chewing on it. Again I didn't get a good shot where it had its eyes open but I still like this one. In the second bird area (which I think is African birds) one of the fist birds we saw was sat on a post right next to the pathway. It had turned around a few times and seemed totally unconcerned about the people going past only inches from it. In this photo it seemed to be posing specially for me and I think this was my shot of the day. 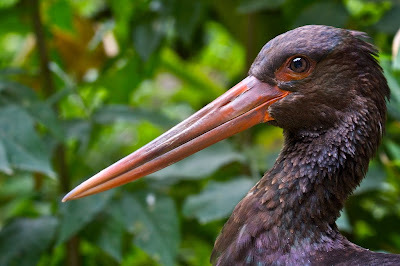 I had the focus perfect on the birds eye and the level of detail on the plumage and beak is amazing, especially at full size. I'm thinking of making an A3 glossy print of this for my study wall. 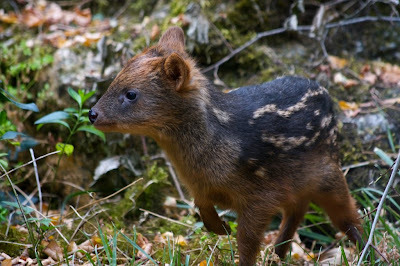 Away from the birds for a while, here is an image of a baby tapir (I think). There were a few adult tapir wandering about but the baby was running around like a maniac. I got a few blurred shots of it but just managed to get this one where it had stopped for a fraction of a second. 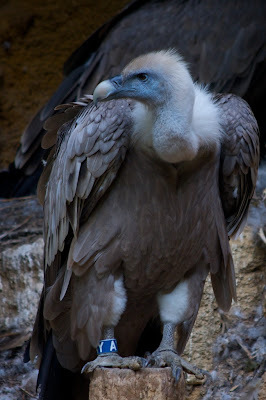 In the vulture enclosure they had quite a variety of different types of vultures and the one thing they had in common was they all had their backs to us. The one exception was this one stood quite near the back in the shadows. There wasn't actually anything stopping us moving off the main path and much closer to them, except of course they were very big and looked pretty mean. Perhaps with a bit more courage I could have got a better shot, or I could have been eaten. 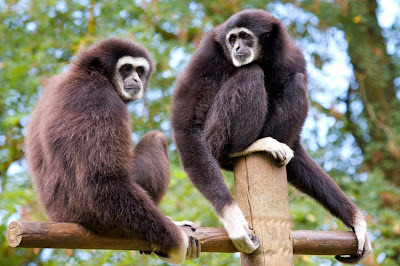 I can't remember what type of monkeys these are but like the baby tapir they spent most of the time running around. To of them stopped for a moment on top of this post and I managed a reasonable shot. It was getting quite a bit brighter by now as it approached midday. 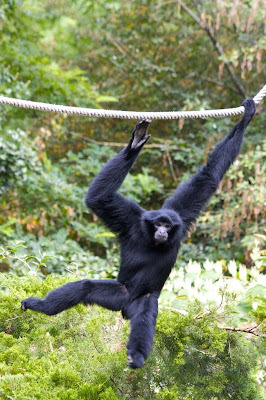 This meant I could use a faster shutter speed to get this monkey in mid swing. 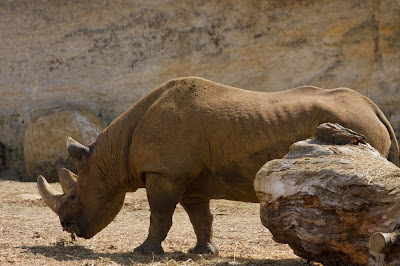 The rhino enclosure was an enormous quarry area where there were just a couple of rhinos, a few of antelopes, some turkeys and what looked like black and white geese. It was all very spread out and the rhinos never came very close to the pathway. 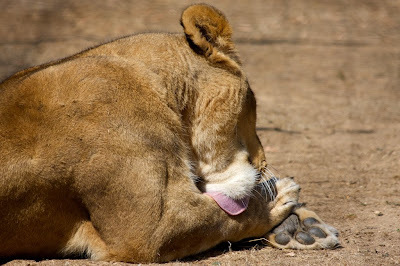 The lioness was giving her paw a good wash with that big, pink tongue. Shortly after I took this photo she started to roll around in the dust and looked to be having fun. Near to the exit of the zoo was the giraffe and zebras, again in quite a big quarry area. This young giraffe came into the main area through this big tunnel in the rock. 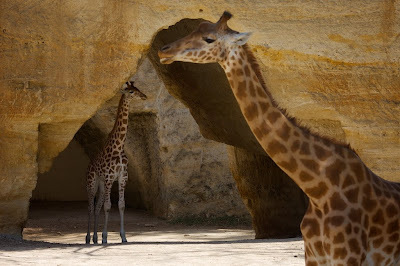 I like this photo because the adult giraffes neck is making a shape that rhymes the shape of the tunnel. However there's something about this image that isn't right and I don't know what it is. I know focus on the adult giraffe is a bit soft but it's not that. Maybe I'll figure it out what's bugging me and then I can have a go at fixing it. The final image. 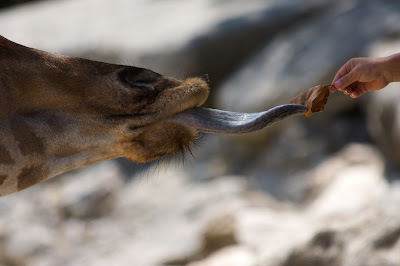 I love this close up of the giraffe trying to take this dead leaf from the childs hand. As with the previous image, there's something not right and I think it's because the background is too light on this one. I might have a go at darkening the background and lightening the giraffe and the hand to see if that looks better. 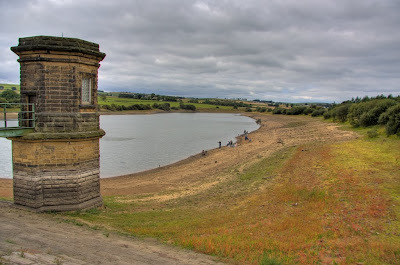 I haven't been to Scout Dyke Reservoir for a few months so I thought I'd go for a walk and see what was going on. 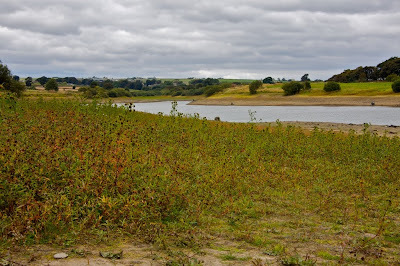 When I arrived I was shocked to see how little water was in the reservoir and it looked as though it had been empty for quite a while. This first image shows the control tower where you can see the line where the normal water level should be. The anglers are usually tucked up under the edge of the trees but today where they're stood would normally be 20 feet under the water. I have seen the water level low before, but never so low. Around the reservoir the weeds have grown very high and are a mass of greens, yellows and reds. And the mud that is normally under the water is baked dry and in some places is cracked. 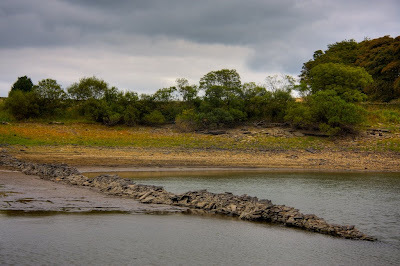 Here is a wall that stretches almost all the way across the reservoir which I have never seen before. I've never seen any hint of its existence even when I've been here before when the water was low down. It was quite interesting to see that there was a build up of silt at this side of the wall which made the ground level several feet higher than the other side of the wall. At the top end of the reservoir there was so much greenery that it looks more like a meadow than the bottom of a reservoir. In this image you would normally see water right up under the trees. I guess the silt that washes down into the reservoir must be quite rich in nutrients because the weeds are lush and green and high. I bought a flash gun just before I went to France and I've been trying to make time to experiment with using it. There is a blog called strobist.blogspot.com where they have some really good advice and a Lighting 101 course to follow. I tried a bit of experimenting while in France but have found the lack of a portrait model quite difficult to contend with. I've taken lots of pictures of vases and flowers but I feel that portraits would be more of a challenge. 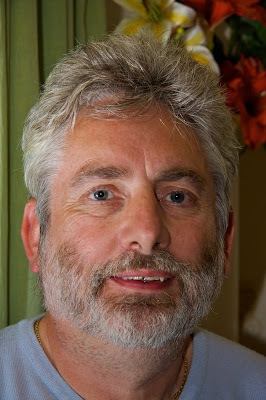 Anyhow I decided to have a go at making a self portrait, a bit vain I know but it could be the start of a new career. It is very difficult to set up the lighting and the camera, then get into the frame to pose. I had to manually focus the lens because autofocus just went straight to the vase of flowers behind where I was going to sit. So I had to focus at an imaginary point in front of the vase, click the button and then get into position and pose before the ten seconds was up. After several hours of moving the light, camera and myself around and then looking in all different directions I ended up with this being my best image. 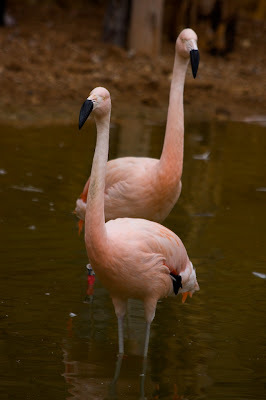 Next blog post should be photos from the Zoo at Doue la Fontaine. So I was sat in the gite looking at the tourist information that the owners had supplied and there was a big leaflet about what's on in the area. 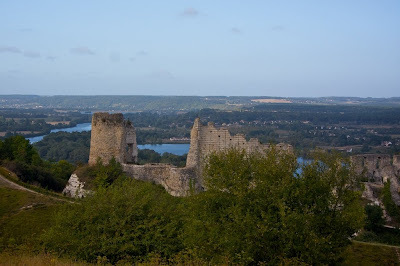 Even though we've been to France many times I still struggle with the language but I was trying to interpret one of the entries which was going on about Mongolfiers at Brissac. 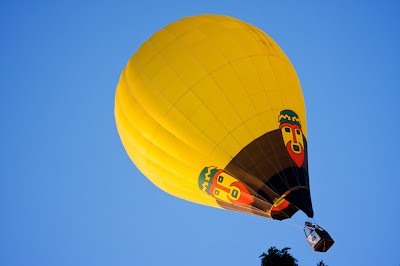 Now I know the Mongolfier brothers pioneered the early hot air balloons so I suspected it was something to do with that. 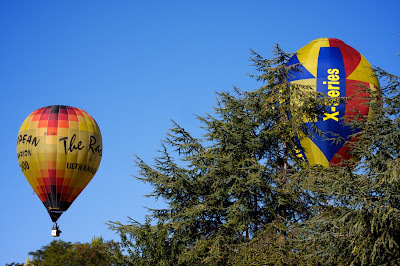 We decided that we'd go to a nearby Sunday market in the morning and then head to Brissac to see what the hot air balloon thing was about. 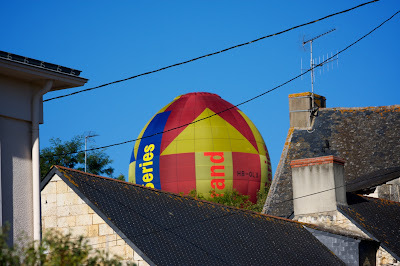 So fairly early on Sunday morning we set out towards the market and within a few hundred yards of the gite we spotted a host of hot air balloons in the distance. 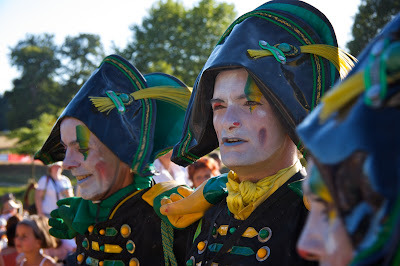 They must have just set off from Brissac which was about ten miles away. As we drove towards the market we watched the balloons as they were heading in roughly the same direction that we were going. When we got to the market it was very disappointing, maybe six stalls and they were still putting them up. We decided to get back in the car and follow the balloons. We first caught up with them as they dropped down by this lovely little village. 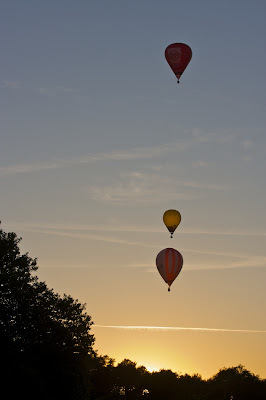 They were dropping down almost to the ground and then setting back off again into the sky. We followed them some more and realised that they were dropping markers down at targets. One particular balloon dropped it's marker right in the middle of some crossroads which raised a cheer with the spectators (we weren't the only ones tracking the balloons). We decided that it must be some kind of race, a bit like orienteering in the sky. One of the balloons dropped right down between this group of houses. 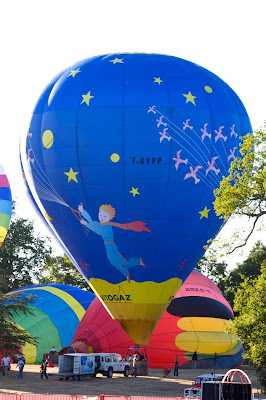 I was talking to one of the people from the houses and they told me that it was the European Hot Air Balloon Championships and that tonight there was a spectacular going on at Brissac and it would be well worth going. She suggested we get there early as there wasn't a great deal of parking. 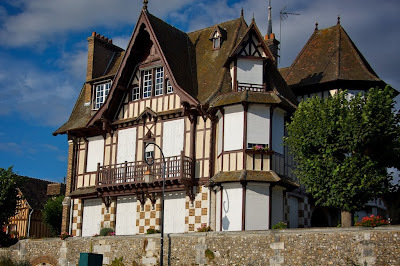 So we decided to go back to the gite, have yet another lazy day and then head for Brissac at tea-time. It was the hottest day of the holiday so we had lunch, sat around the pool and then went to Brissac. We arrived about 5:30pm and the centre of the town had been sealed off and we were directed to a grassed area near the centre of the town to park. We followed people down towards the chateau as we guessed that this was where it was all happening. 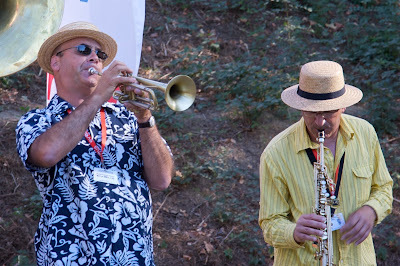 We paid to go into the chateau grounds and as we walked towards an open area this jazz band were playing to the audience. There was a big grassed area where there was a couple of beer tents and lot of food and ice cream stalls. There was a few trees giving shade but these had already been crowded with people because it was really, really hot still. We walked around a bit, then sat on the grass waiting for the show to begin. A very excitable man was on the area at the other side of the moat going on about the spectacular this and spectacular that. Couldn't understand much of what he was saying but we thought it was going to be spectacular. 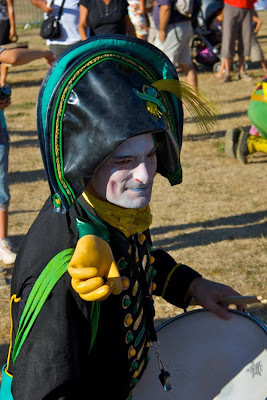 Then we heard the drummers, I left Lynne sat on the grass while I went to get some photos. They stopped for a while to talk to the crowd. Their leader was knelt down talking to some people sat on the grass. I knew he was the leader because he had a whistle. Then he blew his whistle and all his men lined up in a row, standing on anyone who was in the way (in a friendly manner of course, which caused great hilarity with those not in their way). And then they set off again playing their drums as they weaved through the crowd. They stopped again a few times as they made their way all around the spectators area, which was getting quite full by now. After what seemed like hours in the baking sun the vehicles with the balloons started to arrive in the area at the other side of the moat. 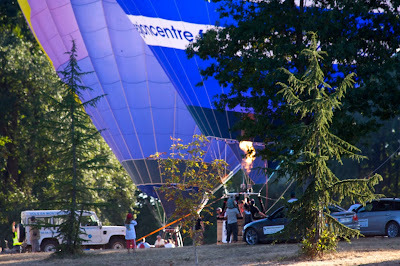 Then the first of the balloons started to be inflated. 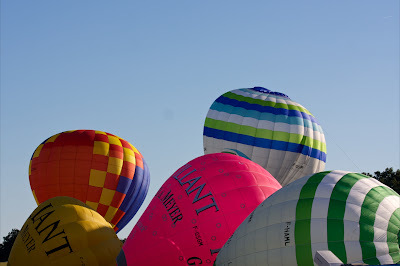 There was such a lot of colour as they started to get bigger and rise into the sky. 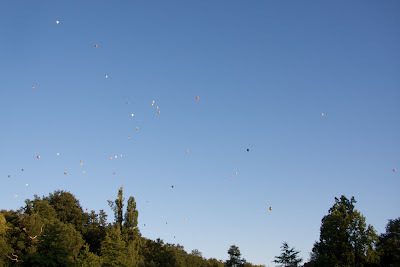 The balloons were spread across a big area and many of them were between the trees. It must have been quite incredible to have been up close to them are they were setting off. Many of the balloons were very pretty and we really liked this one with the child being pulled along by the birds. The sun was mainly behind the balloons and any of them that blocked out the sun for a few seconds got a big cheer from the hot and sweaty crowd. May of the balloons had advertising on them and there seemed to be teams with the same sponsor. 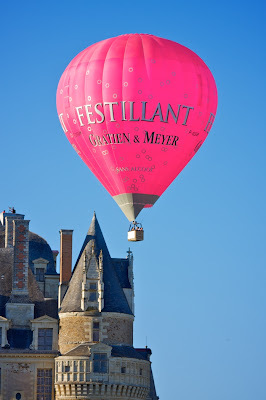 This pink balloon seemed to head in a different direction to all the other ones and came very close to the chateau. 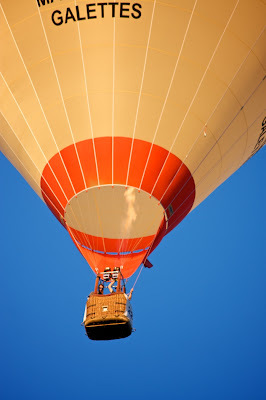 The people in the balloon must have been able to see right into the windows as they sailed by. One of the last balloons to set off was this very strange joker. It had been one of the closest ones to the spectators but it was hard to make out what it was until it had set off. Then all the balloons had gone so we went and had a drink and tried to find some shelter from the sun. Although it was getting towards 8pm by now the sun was still very hot and the area was very dusty. 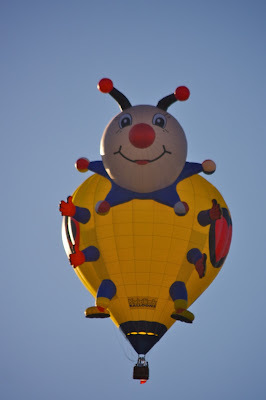 Suddenly I spotted a hot air ballooon coming from the other direction to where the ones that had set off had gone. 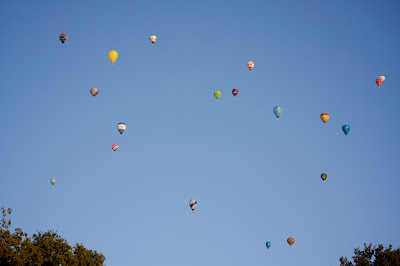 Then another, and another until the sky was filled with almost 50 balloons. They were heading straight towards us and as they got closer to us they also got closer together. These were definitely a different set of balloons to the ones that we had watched set off and we recognised some of them that we had seen in the morning. We really liked this one from Stockholm and I was lucky that it turned just to the right spot to get a picture with the whole drawing facing me. This one came down very close to where we were standing and you could see the people up there looking down at us. Most of the balloons came down low at the other side of the moat and we wondered if they were about to land, but they didn't. Some of them dropped markers like we'd seen them doing in the morning. 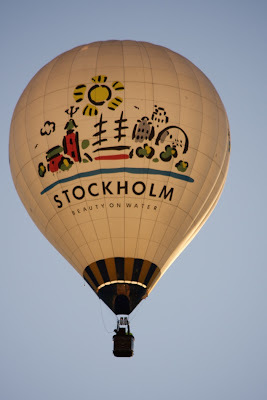 This was one of the balloons we'd seen in the morning with the strange face on the side. As the last of the balloons drifted off into the sunset it started to get dark and our excitable friend on the microphone returned to tell us again how spectacular it was going to be. We didn't know what was to happen next but we had seen a stage with a big crane next to it and this seemed to be where everyone was heading. 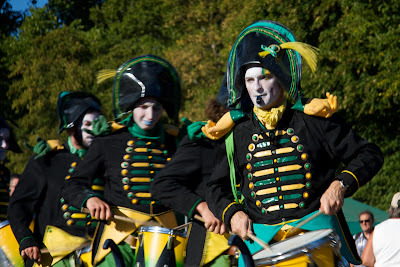 Then the drummers returned weaving through the crowd again. 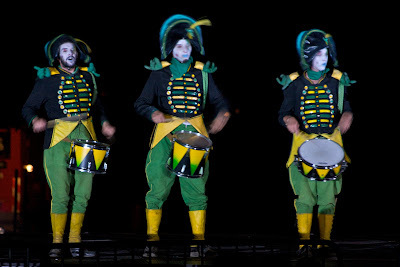 It seemed to get dark very suddenly and there were some big spotlights following the drummers around. I tried to get some photos of them in the crowd but even at the maximum sensitivity on y camera(ISO 1600) the shutter speed was still too long and the pictures are very blurred. Eventually they made their way to the stage and I managed to get a couple of not quite as blurred photos of them. 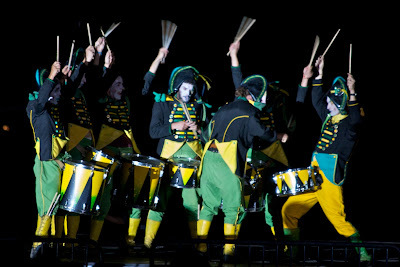 They played their drums and danced around the stage for a while. There had also been a girl with them but she had disappeared. Then the stage went dark and the drumming continued. 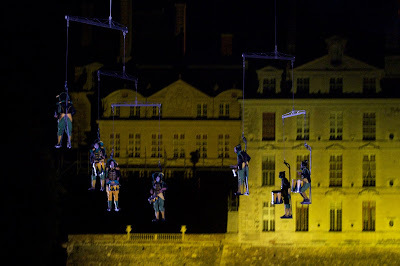 After a while the lights came back up and the drummers were suspended on a living mobile above the stage. 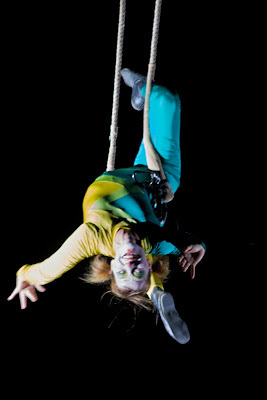 The girl was on a trapeze way above the drummers and they were all hanging from the big crane. The crane swung around taking the drummers over the moat and then right over the crowd in front of the stage. 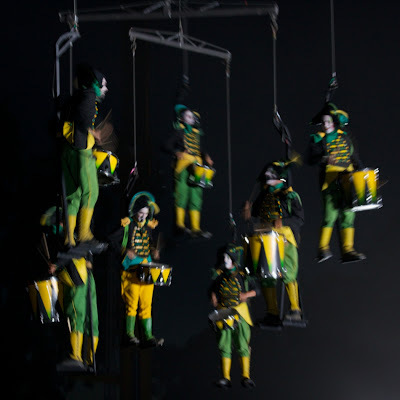 At one point they dropped down low above the heads of the people and then they suddenly shot up nearly a hundred feet in the air (it wouldn't happen in England, the Health and Safety Executive wouldn't allow this). 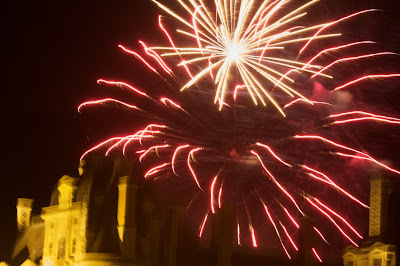 Most of my photos were very blurred but one or two were almost definable. 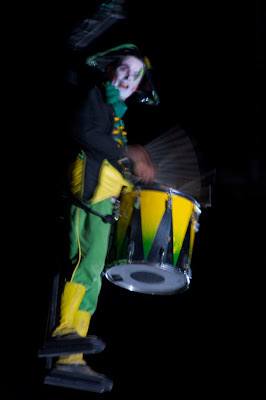 This was by far the best of the photos of the girl as she did her acrobatics above the drummers. The ones where she is moving are very blurred but I guess are showing the movement. This one is where she held a pose for a few seconds. I think at focal length 275mm this shot taken at 1/50 second isn't far off being sharp. This next one might even be sharper but unfortunately she was facing away from us. 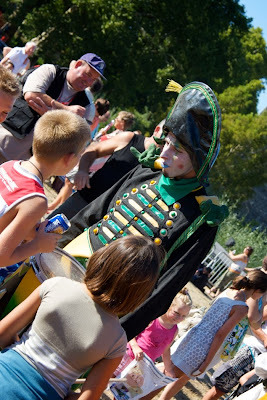 The crane swung around again and put the drummers in front of the chateau which makes a nice shot. We decided to try and get out of the area before the crush at the end of the night. Lynne's not a big fan of crowds, especially when it's dark. 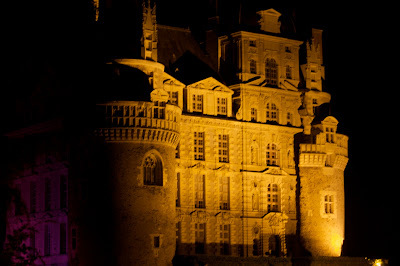 As we went back past the chateau I took this shot of it lit up. 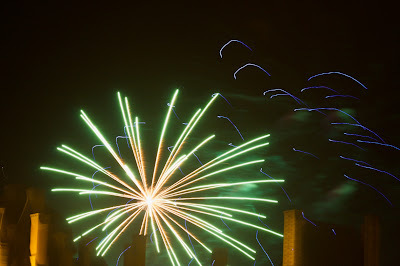 As we got up towards the town centre the fireworks started and very loud music boomed across the valley. Jean Michel Jarre I think it was. 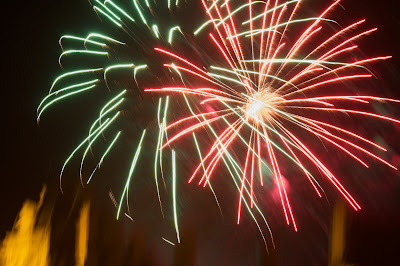 We stopped for a while and I took a few more shots of the fireworks. It was still warm even at 10:30 and it had been a very long, very hot day for us after getting up early to go to the market. We drove back to the gite, had a quick drink and then straight to bed.